George Graham reviews Rhythmic Statues "One Big Day"
Jam bands are everywhere on the local level, but there have not been that many outstanding groups in the genre to emerge with albums in the last couple of years. Meanwhile, the sort of troika of today’s leading active jam bands, String Cheese Incident, Umphrey’s McGee and Moe continue, with a trend toward making more succinct studio recordings with fewer opportunities to stretch out instrumentally, which is the definition of a jam band. But this week we have an impressive recording by a jam band who bring all the right ingredients together in a studio album that nevertheless allows the band to get into some improvising in a classic manner. 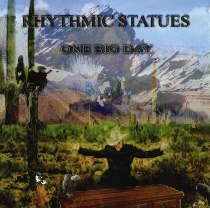 The group is called Rhythmic Statues and their new release is called One Big Day. Rhythmic Statues are headquartered in Austin, TX, and consist of four experienced musicians who have had carers playing for, and serving as backup for such artists as Mumford and Sons, Arthur Brown, and Joe Ely. The group had its beginnings as a part-time project in the early 2000s, but after some changes in personnel, Rhythmic Statues became a more regular band starting in 2012. They consist of bassist, lead vocalist and principal songwriter Mike Morgan who in his past, produced and appeared on an album by poet Allen Ginsburg; guitarist Carter Arrington; keyboard man Darrell Commander and drummer Pat Manske. They have become a tight knit group who can do the musical ball-tossing among instruments for solos that makes them the definition of jam band. Their sound can resemble the String Cheese Incident and their lyrics can sometimes be whimsical or nonsensical like String Cheese. Their music can run more toward the Americana sound with some country influence but very little in terms of straight jazz tendencies. The players are solid, but not showy. Their approach is that of keeping the groove and not venturing far beyond the rock world stylistically. There are different textures to the tracks, though, with some psychedelia, a dash New Orleans groove, a little country rock and some funk, but they keep a kind of basic sound that becomes the group’s trademark. Lyrically, when they are not being whimsical, a few of the tracks get into social consciousness, and a few take a philosophical direction, rather like the hippie days that provided the inspiration for the modern jam band movement. The album is a generous one at over an hour, with ten mostly lengthy studio tracks which largely sound as if they were recorded live, though there are a few instances of overdubbing apparent. But Rhythmic Statues remains a jam band in the studio. Rhythmic Statues gets into a kind of New Orleans beat on a tune called Jump. The lyrics make reference to poet Allen Ginsberg with whom the band’s principal songwriter Mike Morgan had collaborated. There are a good number of groups on the scene these days who have, what I suppose, could be called jam band tendencies, getting into improvisation at times in the context of their more structured music. On their new album One Big Day, Rhythmic Statues are a straight-out, no-apologies jam band whose basic style tends toward roots rock and Americana, but one can hear the influence of groups like the String Cheese Incident and even echoes of the Grateful Dead. They turn what seem like more structured songs into opportunities for stretching out instrumentally even in the studio in their album. They have the musical chops to be able to pull it off without getting into mere noodling as lesser groups have been known to do. Guitarist Carter Arrington is a particularly strong and fleet player. The group’s compositions are worthwhile, though by themselves not all that remarkable. But when they start jamming, they raise the level considerably. Our grade for audio quality is about an A-minus. The sound is clean and free from the unnecessary or trendy studio effects. The vocals have good clarity, something that is becoming rarer these days. The dynamic range could have been better. Things are pretty much all at the same volume, but at least it’s not hyper-compressed to be screaming loud all of the time, as so many albums are these days. Jam bands are best live, and barring that, captured on a live album. But Rhythmic Statues have made one of the better jam band studio records I have heard in quite a while.